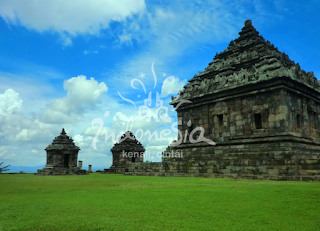 IndonesiaTravelVisit.com | Ijo (in Javanese language, this word means 'Green') temple is a temple located at the highest place in Yogyakarta that presents natural and cultural enchantment with additional view of taking off and landing airplane. Going along the street leading to the southern part of Queen Boko Palace complex is such an exciting journey, especially for cultural tourism lovers. The reason is that there are so many temples mushrooming in that area. One of them that is rarely talked about is Candi Ijo or Ijo Temple; one temple of which location is the highest compared to other temples in Yogyakarta. 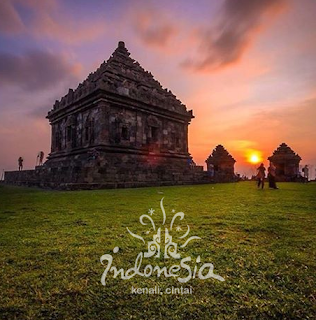 Ijo Temple was built in around the ninth century on a hill named the Green Hill of which height is 410 meters above the sea level. Because of this height, we can enjoy not only the temple but also natural view below such as terraces of agriculture land with its steep slope. Even though this is not a fertile area, natural view around the temple is so beautiful to enjoy. The complex of the temple consists of 17 building structures that are divided into 11 terraces. The first terrace functioning as the yard leading to the entrance is a terrace with staircase stretching from west to east. The building on the eleventh terrace is in the form of encircling wall, eight pole phallus, four buildings namely the main temple, and three ancillary temples. The placement of the building on each terrace is based on the level of its being sacral. The building on the highest terrace is the most sacral. Variants of painting are found since the entrance of this Hindu temple. Right on the entrance gate, there is a motif of double head giant and some of its attributes. Such motif and attributes found in Buddhist temples show that such temples are acculturation forms of Hindu and Buddha cultures. Some temples having such giant motif are Ngawen, Plaosan and Sari. There is also a statue describing flying woman and man directing to certain side. Such description can have some meanings; first, as spells to expel evil spirit and second as symbol of unity between god Siva and goddess Umi. The unity is meant as the onset of universe creation. Different from the statues in Prambanan Temple, natural style of the statues in Ijo Temple do not lead to eroticism. Approaching the ancillary temples on the eleventh terrace, there is a pit possible used to burn sacrifice. Right on the upper part of the pit back wall there are ventilations in the forms of trapezium and triangle. The pit reflects the Hindu community that adores Brahma, the god of fire. The three ancillary temples show community adoration to the three Hindu gods, namely Brahma, Siva, and Vishnu. Some of the works that keep mystery are two inscriptions located in the temple building on the ninth terrace. One of the inscriptions is coded by letter F with the writing Guywan or Bluyutan meaning place for meditation. Another inscription is made of stone as high as 14 cm and as thick as 9 cm containing magic spells that are predicted to be curses. The magic spells were written 16 times and parts of them read "Om Sarwwawinasa, Sarwwawinasa." The two inscriptions may relate closely to certain occurrences in Java by that time. What were the occurrences? They are not revealed yet up to now. Visiting this temple, you will find beautiful scenery that other temples do not have. Looking down westwards, you will see airplane taking off and landing at Adisutjipto International Airport. You see this scenery because the Seribu Mountains where Ijo Temple is located is the border of the east part of the airport. It is because of the presence of this temple that Adisutjipto Airport cannot be lengthened eastwards. Each detail of the temple presents meaningful thing and invites the visitors to make a reflection so that the journey will not just be fun time. Great paintings without the name of the creators show life philosophy of the past Javanese community that emphasized more on moral message presented by the works rather than the creators or the greatness of their works. 0 Komentar untuk "IJO TEMPLE , The Temple Located at The Highest Place in Yogyakarta"